We recently had the opportunity of a lifetime to work with one of the world’s great explorers, Ben Saunders, as he prepares to embark upon the Scott Expedition. Ben will do the four-month, 1,800 mile journey on foot from Antarctica to the South Pole, a feat that has never been achieved and was made famous by the late Captain Scott who’s team sadly perished on return. The perfect project for us, it combined two of Steve’s great loves: exploring and design. 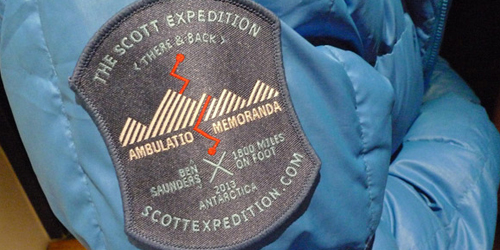 As well as working on graphics for the team’s kit, we also had the opportunity to create the expedition badge. It has been a lifelong ambition of Steve’s to create a badge for a great explorer having been inspired by the NASA badges since he was young. We went with a simple graphic representation of the walk itself supported by the Latin phrase ‘amublatio memoranda’, meaning ‘a walk to remember’. With less than a week to go, please join us in wishing Ben all the best!